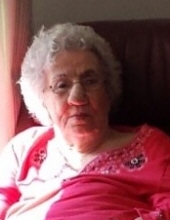 Olivia Jane “Jennie” Anderson Bullard, 96, widow of Willie Thad Bullard and Spencer Altman, passed away Saturday, January 12, 2019, at a nursing facility in Moncks Corner. Mrs. Bullard was born February 5, 1922, in Georgetown, a daughter of the late John Walter Anderson and Lillian Maude Roberts Anderson. She grew up in Georgetown and graduated from Winyah High School. Jenny met her husband Willie through neighbors while he was in the military and they were married for fifty years. Mrs. Bullard was a member of Rose Hill Baptist Church. She love to read, crochet, play bingo and was an excellent seamstress. She loved traveling and was a wonderful cook and a great baker. In addition to her husbands, Mrs. Bullard was predeceased by: a son, Robert L. Altman; and a grandson, Thomas J. Owens, Jr. Surviving are: four sons, Bethel S. Altman (Nita), Gerald Altman (Trista), James S. Altman (Brenda) and Willie T. Bullard, Jr. (Suzie); two daughters, Sandra Wilkins and Fran McCoy (Terry); ten grandchildren, twenty-three great-grandchildren and three great-great grandchildren. Memorial Services will be one o’clock Monday afternoon, January 14, 2019, in the Georgetown Chapel of Mayer Funeral Home. Officiating will be the Rev, Andrew Wilkes. Memorial may be made to: Rose Hill Baptist Church, 4572 Rose Hill Road, Georgetown, SC 29440. To send flowers or a remembrance gift to the family of Olivia Jane "Jennie" Anderson Bullard, please visit our Tribute Store. "Email Address" would like to share the life celebration of Olivia Jane "Jennie" Anderson Bullard. Click on the "link" to go to share a favorite memory or leave a condolence message for the family.